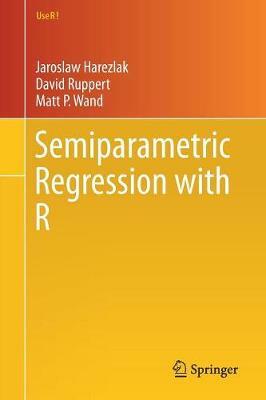 This easy-to-follow applied book on semiparametric regression methods using R is intended to close the gap between the available methodology and its use in practice. Semiparametric regression has a large literature but much of it is geared towards data analysts who have advanced knowledge of statistical methods. While R now has a great deal of semiparametric regression functionality, many of these developments have not trickled down to rank-and-file statistical analysts. The authors assemble a broad range of semiparametric regression R analyses and put them in a form that is useful for applied researchers. There are chapters devoted to penalized spines, generalized additive models, grouped data, bivariate extensions of penalized spines, and spatial semi-parametric regression models. Where feasible, the R code is provided in the text, however the book is also accompanied by an external website complete with datasets and R code. Because of its flexibility, semiparametric regression has proven to be of great value with many applications in fields as diverse as astronomy, biology, medicine, economics, and finance. This book is intended for applied statistical analysts who have some familiarity with R.
David Ruppert is Professor of Statistical Science and the Andrew Schultz Jr. Professor of Engineering at the School of Operations Research and Information Engineering at Cornell University. He is a Fellow of the American Statistical Association and the Institute of Mathematical Statistics and received the Wilcoxon Prize in 1986. Ruppert was named a Highly Cited researcher by ISI, now known as Clarivate Analytics. His current research focuses on astrostatistics, measurement error models, splines, semiparametric regression, and environmental statistics. He has published over 100 articles in refereed journals and has published five books.He is a past editor of the Journal of the American Statistical Association and of the Electronic Journal of Statistics Jaroslaw Harezlak is Associate Professor in the Department of Epidemiology and Biostatistics at the Indiana University School of Public Health in Bloomington. He has a Ph.D. in biostatistics from the Harvard University. After a 2-year post-doctoral training at the Harvard School of Public Health, he joined Indiana University as an Assistant Professor. His interests span a number of medical areas: including NeuroHIV, physical activity, sexually transmitted infections, and concussions, as well as statistical areas: including semiparametric regression, functional data analysis and structured high-dimensional data. In his applied research, he uses data arising in structural and functional brain imaging, accelerometry, and intensively collected longitudinal studies. He has published over 50 peer-reviewed articles in the statistical, medical and epidemiological journals as well as 3 invited chapters. Matt Wand is Distinguished Professor of Statistics at University of Technology Sydney. He serves as an associate editor for the Statistics journal: Australian and New Zealand Journal of Statistics. Professor Wand is chiefly interested in the development of statistical methodology for finding useful structure in large multivariate data sets. Currently, Wand's specific interests include expectation propagation, message passing algorithms, variational approximate methods, statistical methods for streaming data, generalized linear mixed models, and semiparametric regression.